As we found out our new house has yet again been delayed, we decided a weekend trip to San Sebastian was necessary to cheer ourselves up. 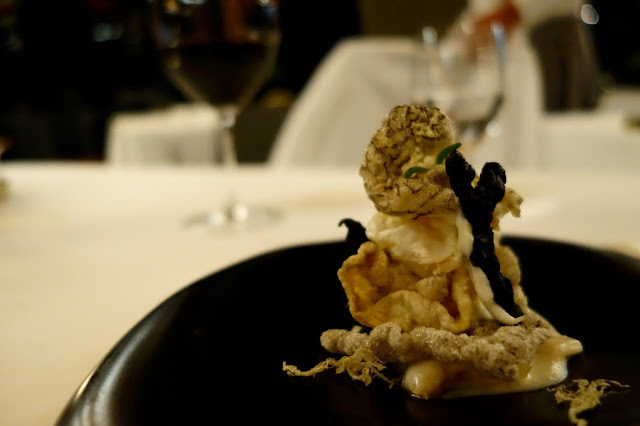 Out of the star restaurants in the region, Arzak is best known, perhaps because it features on both the worlds best list and on the Michelin guide. Unfortunately we only decided on this trip end of March, so most of the places were booked out for Saturday dinner, except for Akelare. So Akelare it is. The restaurant is little out of the main town centre, about 20mins on Bus 16 of 15mins by taxi. The grand entrance was elegant and modern, I think they are developing a hotel on site. 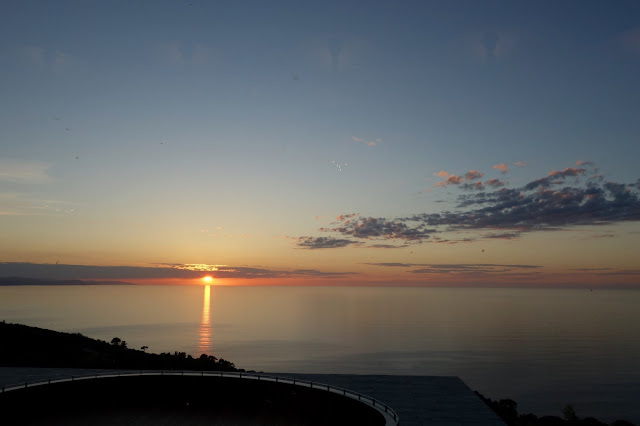 Upon entering the dining room, we were greeted with a panoramic view of the sunset over the sea. Stunning. The dining room was quite classic with polished wooden panels and plenty of natural light. The ambience grew more intimate and cosy as night fell. There were 3 tasting menus, Aranori, Bekarki, and Akelare's Classic. The first two were more experimental while the classics feature the all-time favourites from the establishment. We were given the option to pick from any of the three for the meat main course. We felt at least one of us was obliged to pick the classics menu, which sounded like it featured all the signature dishes. Looking around us, I think at least 70% of the dining thought the same. But the other two menus simply looked much more exciting... we took a punt and went for Aranori and Bekarki. This is going to be a long post. 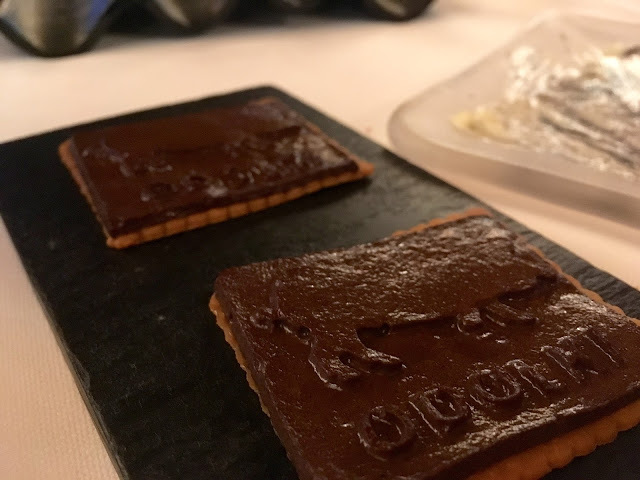 We started with an array of amuse bouche: 'bloody mary'; 'diabolic butter' that was a sheet of cheese-infused butter served with colourful bruschetta and potato snacks; black pudding cookies. 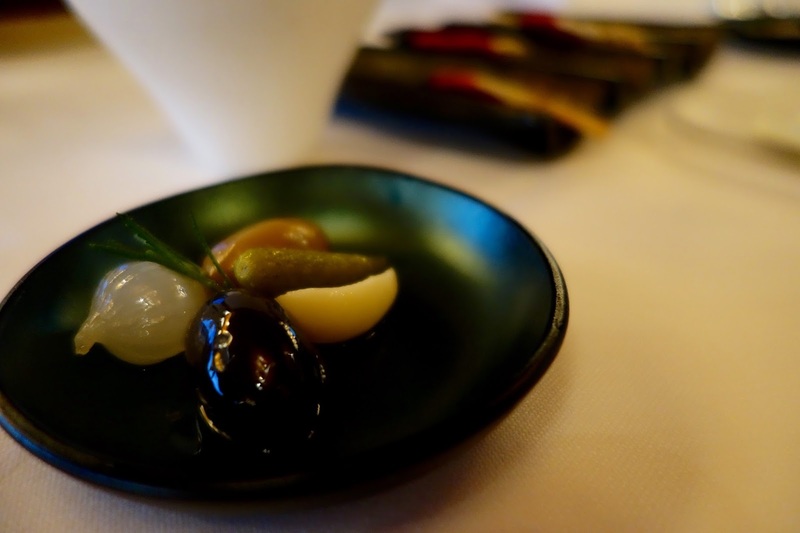 The best was no doubt the 'olives'; the green one was filled with chorizo and liver cream, and the flavours were unforgettable as it was smeared on tongue. The black one was filled with anchovy cream, powerful and punchy. 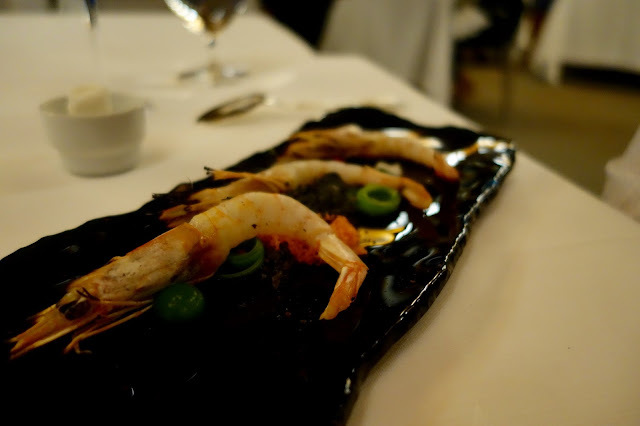 The results were incredible, pink translucent prawns that were just-cooked, bouncy, crunchy and immensely succulent, oozing smoky fragrance from the open flame, served on a bed of popping roe. The most mind-blowing part though, was sucking the head of the prawn - flavoursome and creamy, bursting with shellfish goodness - fricking delicious. 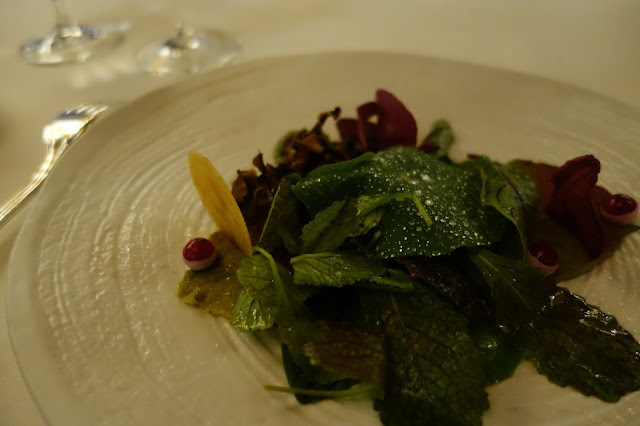 My first course was not as light as it seems, among the various leaves, the two big ones at the bottom were actually cold foie gras! So cleverly disguised. Beautifully dressed with the aromatic-infused dews. 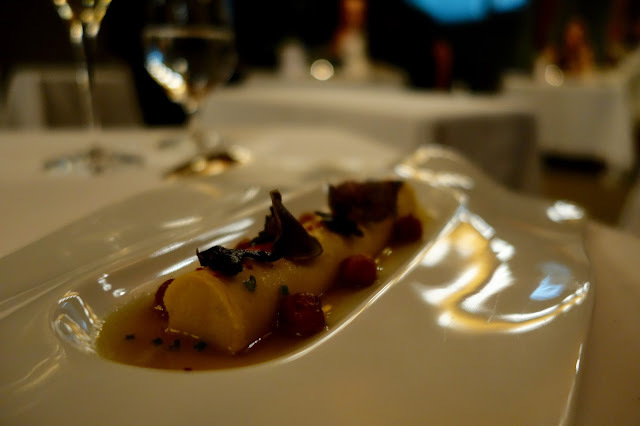 The vegetarian course was a mixture of chickpeas and potato purée, velvety smooth and accompanied with a deep savoury jus. Presentation was stunning; it arrived with a little infusion bag made of obulato, holding monkfish crisp, prawn powder and herbs, the server then poured a clear broth that melted the bag, unleashing all the flavours. 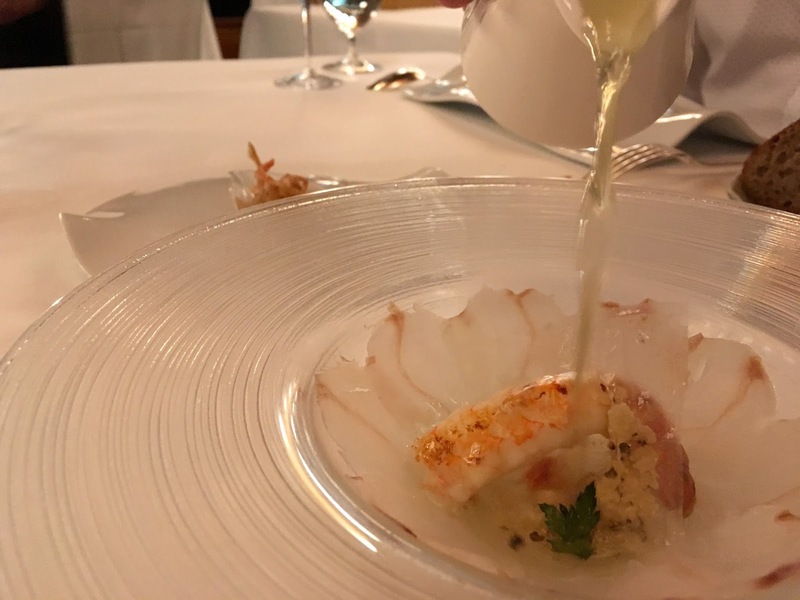 The thin slices of smoked monkfish lining the plate were delicate and the smokiness worked well with the clean oceanic broth; the scampi was sweet, meaty and full of bounce. Gorgeous. Things went up a gear. The fish cheeks were puffed to an airy crisp with seaweed tempura, smeared with A layer of garlic purée. Like a breath of salty sea. 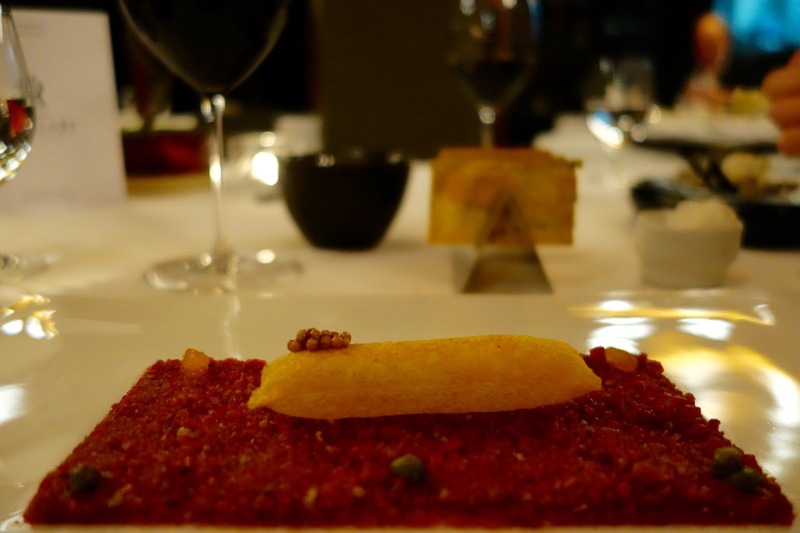 The bed of molecular beef tartar was like ice cream - so fine and so soft the tartar flavours smeared across my tongue; most interesting texture. 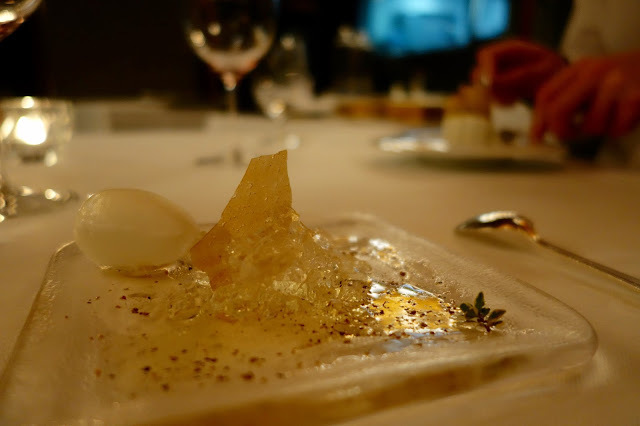 The accompaniments were mostly brittle breads and the ultra thin potato crisp, which I'm not mad about. If I may, perhaps I would find it even more enjoyable with some form of yolk to moisten the crackers on the side. He said this was the most delicious thing he has eaten. 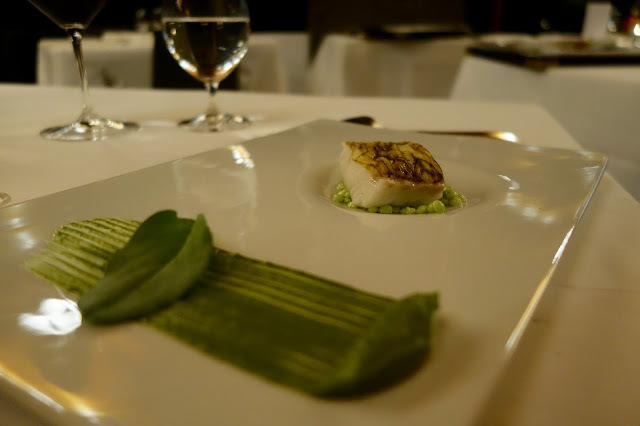 The small bloc of fish was infused with seaweed fragrance, served on a bed of beautiful plankton pearls, which tastes like.. the sea; it's elegant and subtle that leaves a long finish on the taste buds, like concentrated sashimi. The fillet was intricately steamed to ultimate silkiness, and melted on tongue to release the lasting trail of oceanic goodness. Truly divine. By contrast my sea bass was less exciting. 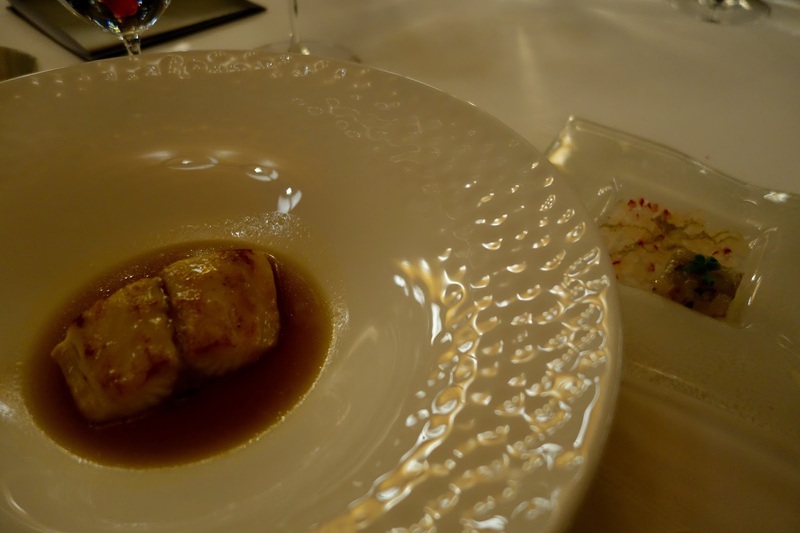 The umami broth was fairly flat, and the texture of the fish was slightly firmer and leaner. Despite the small cube of shiso-mixed sashimi mince served on the side, this was simply up against serious competition next to his hake course. Another bomb. 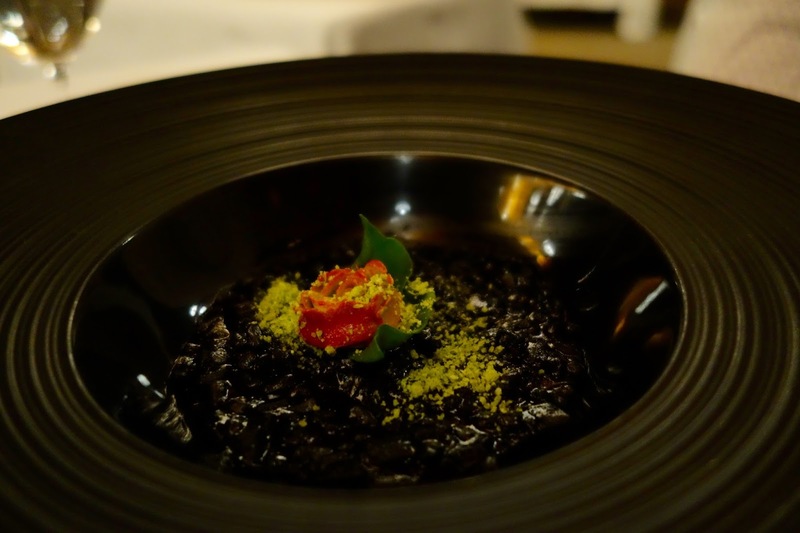 The rose-shaped butter arrived on the side and we were instructed to tip it into the black pool of squid risotto, which was playful and springy. 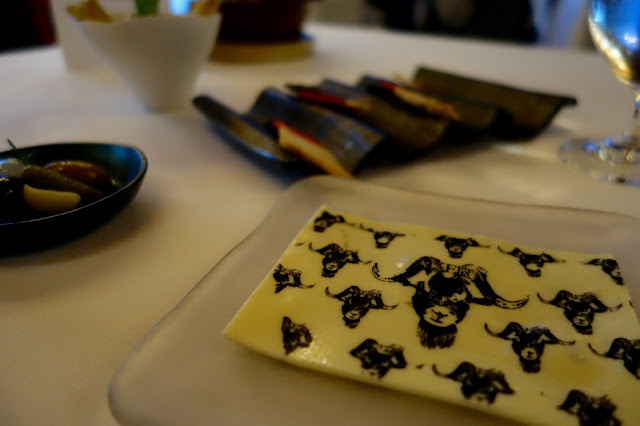 The flavours were stunning; savoury butter and the squid ink were magical together, bringing to life the tiny diced squid. It was tantalising. 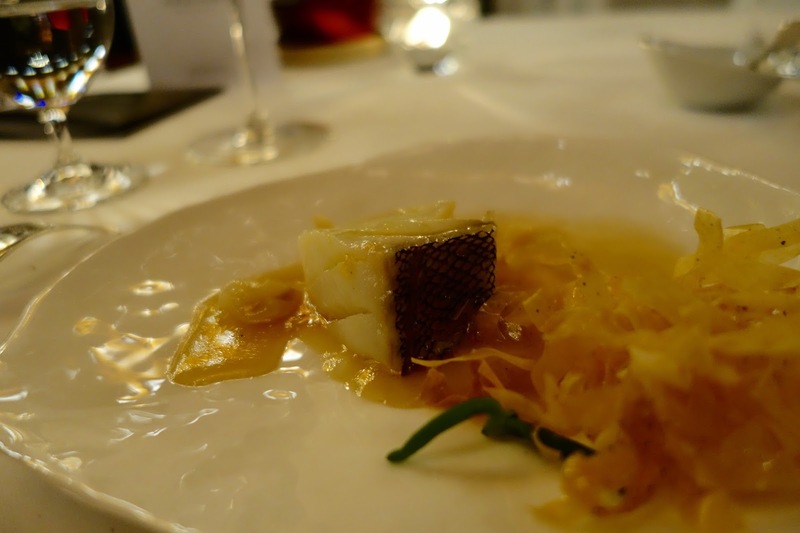 The cod arrived in a wooden box, and our server explained the fish had been crystallised. I'm guessing the process makes it softer by forming oil crystals? Not sure. The gelatinous jus was very interesting; it was tomato water, not dissimilar to diluted ketchup, except it was the natural sweetness from tomato essence and much more refined. The edible shavings were dried thin pasta, adding some crunch to the mix. 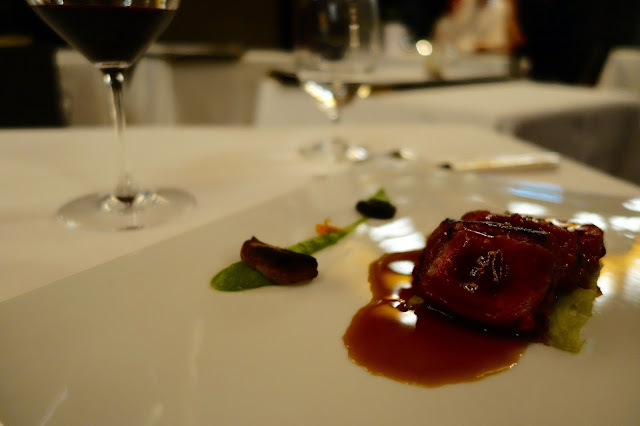 Roasted 5J pork, served slightly pink in the middle, and lacquered with red pepper juice. The capsicum sweetness and mild piquant kick worked well with the meat. The highlight was actually the three types of garlic, especially the one that was coated with charcoal dust; it was mushy but super concentrated, like it had packed a whole bulb of garlic in that little clove. The kitchen must have done something ingenious. 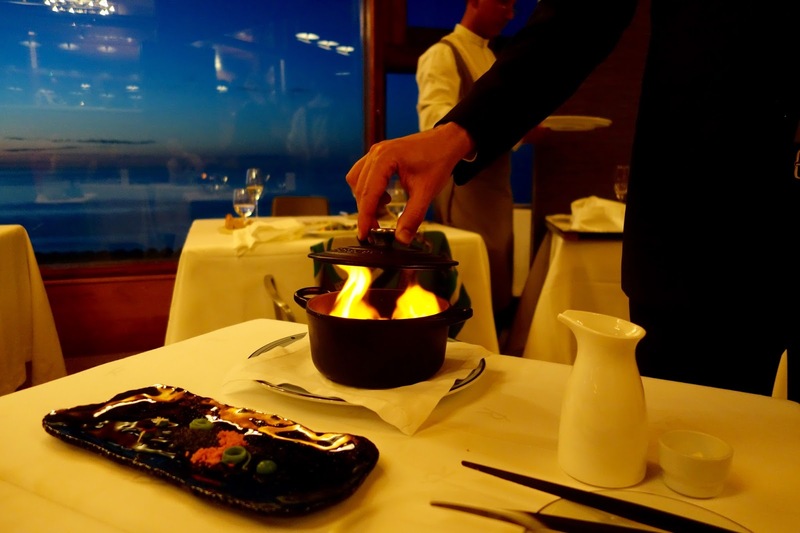 To get a crispy and juicy texture, the baby pig is cooked in Iberian broth and finished in the oven. 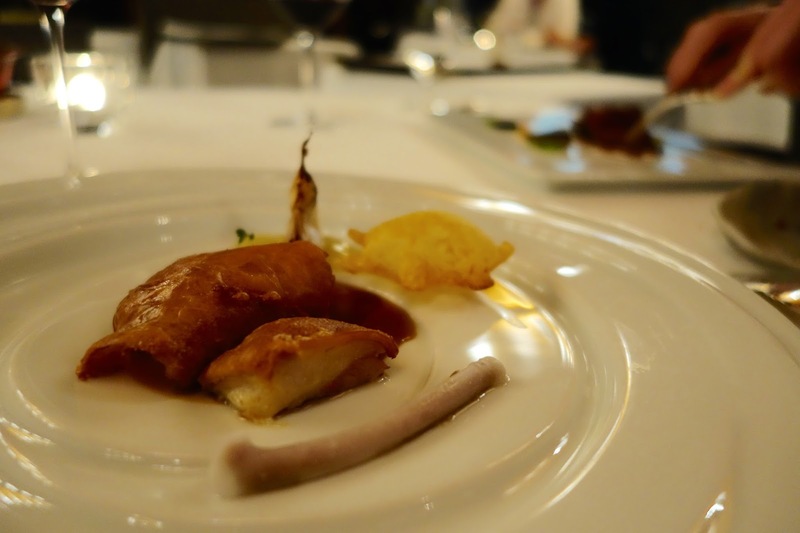 The 'bone' was made with a sugar coat with porky essence in the middle. And we were told to start with the baby pig, then a bite of the bone. Exemplary suckling pig with a little twist. The cake was made with yoghurt foam, filled with coffee and chestnut as well as some grapefruit. Didn't work for us, plasticky cake and grapefruit coffee was as odd as it sounds. We decided the pre-dessert is also a bit too whacky. Mine was no better. An authentic gin & tonic in jelly form is no more tasty than the drink. The combination was sour from the juniper sauce and bitter from the alcohol. Meh. The was amazing. The Akelare-branded wrapper was edible and tasted like apple; we unveiled the crazily buttery and crumbly pastry hidden with fluffy apple cream. It was so much better than the traditional ones. 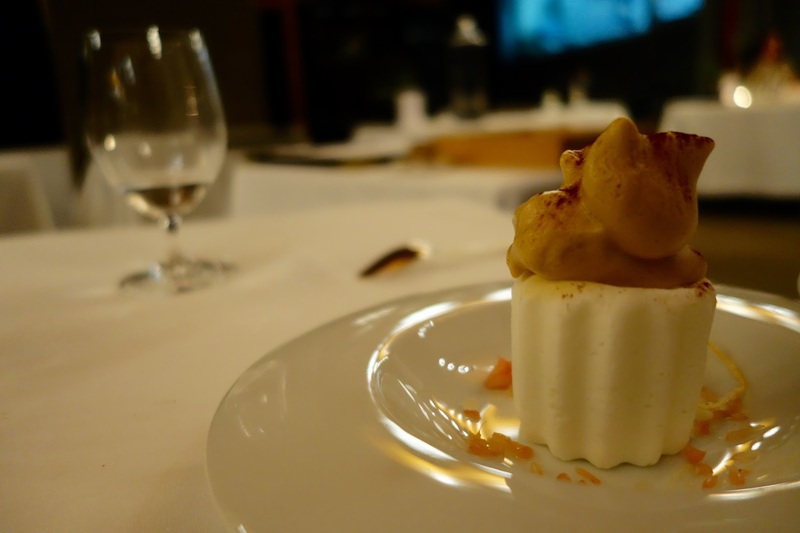 Tolosa traditional little cake with the permission of Gorrotxategui pastry chef. 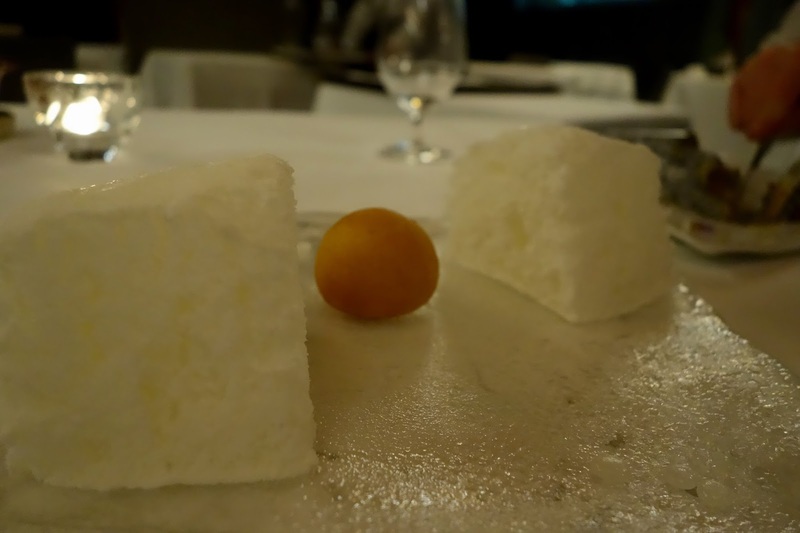 The ball was made of egg and almond with a runny custardy centre, and the coconut icebergs on the sides were like eating coconut air. Something different. A good different. Whoa. It was past mid-night by the time we got the bill and requested a taxi. 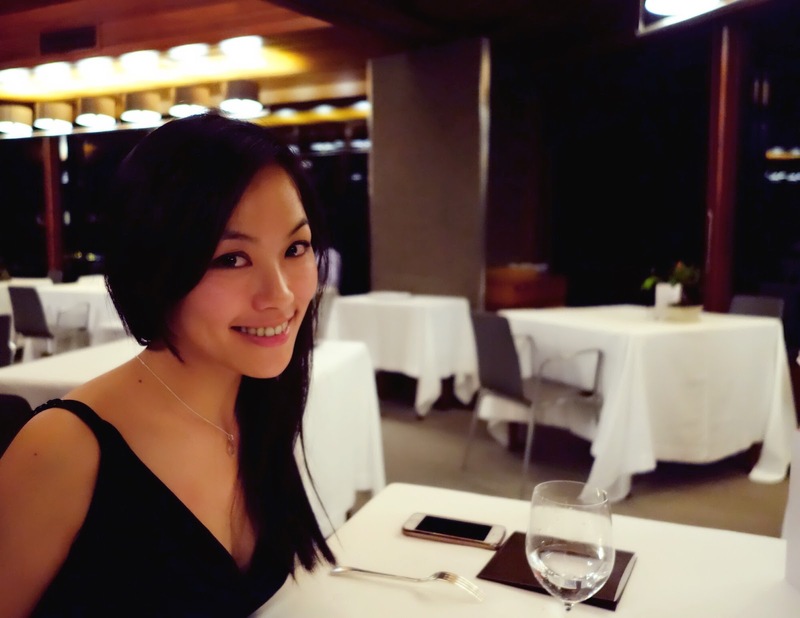 The pace of dinner was surprising swift; each course followed within a few minutes of each other. Perhaps we were particularly slow eaters, but it didn't feel like we had to wait around much. Not to the point that we were rushed though, we quite liked it. 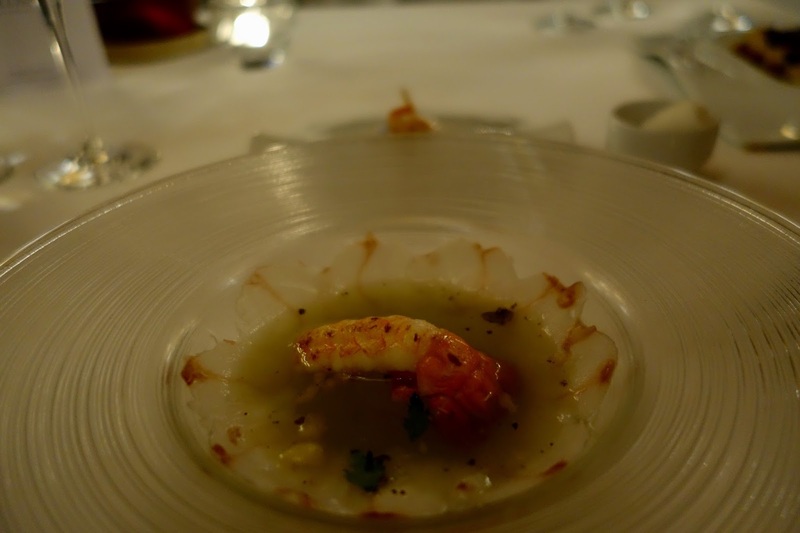 The dining experience was truly exceptional and sophisticated. The courses were designed to maximise our senses; just as we thought we knew what squid tasted like, chef showed us a new dimension to it. 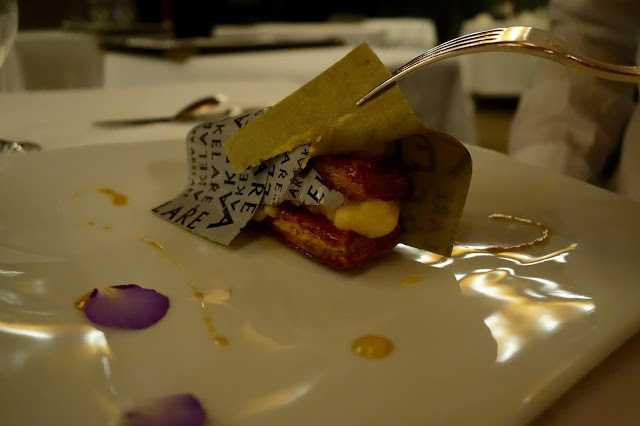 A colleague of his had both Arzak and Akelare in one trip, said Arzak was even better. That might be true, but we don't know which menu he had. This is precisely why we didn't want to cram Arzak or Mugaritz for Sunday lunch; putting one right next to another is likely to mar at least one of them. So we can say now, we loved Akelare; and we are looking forward to Arzak in a few months time.